No one ever wants warts. Beyond the fact that they can be physically unappealing, depending on the type and what may cause them, there is always a stigma attached to having a wart of any kind. Unfortunately, filiform warts fall into that category. In this piece, we are going to look at filiform wart causes, if they are contagious, and how you can treat them both medically and naturally. Hopefully, by the time you are done reading this, you will have a better understanding of filiform warts. Filiform warts are warts that are fleshy and kind of finger-like. They usually form around the eyes, nose, mouth and throat area. They are caused or inflamed by a number of causes. The biggest cause of filiform warts is the human papilloma virus, or HPV. HPV triggers something in the body’s immune system, which affects the keratinocytes in the immune system. This causes the overproduction of keratin which results in warts forming on the skin. In this case, it’s mainly HPV-1 and HPV-2 as the causes of warts, but HPV-4, HPV-27, and HPV-29 have also been known to cause warts. Stress can cause a similar reaction within a person if the HPV virus is present in the system. A time of high stress can activate the immune system, triggering the creation of filiform warts. A weak immune system also doesn’t help, as it will allow the HPV to take hold and create warts. If you’re not getting all of your nutrients, especially those like vitamin C that help your with your skin’s health and repair, you can be more susceptible to filiform warts forming. It should be mentioned that not all HPV can cause filiform warts. Now that we’ve covered the causes of filiform warts, it’s time to go over the symptoms. Filiform warts, unfortunately, don’t have much in the way of warning sign symptoms, which means treatment usually occurs after the warts have appeared. However, there are some fair, specific symptoms to filiform warts in particular. As previously mentioned, filiform warts are created when the body makes too much keratin. The keratin can often make a hard patch of skin where the wart will erupt. The skin will be hard, rough, or both, but will still maintain regular skin pigment. The skin around that area may even be brittle and flaky. Filiform warts are recognizable mainly due to their appearance. They tend to be fleshy, finger-like masses. They are usually flesh-colored. This can make them hard to spot before they erupt, as they will blend in with the rest of your skin. Filiform warts typically form around the face, especially around the eyes and lip areas. This is not to say they won’t spread to other parts of the body. A blood vessel may rupture around the wart area plasma, in order to seep into the skin around. This will produce dark dots under the wart. Warts can be itchy as a sign of the infection slowly spreading. As the infection that causes warts gets stronger, the skin will have a harder time repairing itself. It can start to break, and cause bleeding. Now there is one good thing about filiform warts, and that’s the fact that for the most part, they aren’t painful. Now if it spreads somewhere on the body where they get rubbed, like under where shirt collar area, they can become irritated if repeatedly rubbed. These symptoms can seemingly come out of nowhere, and can be hard to look at and touch. This will lead many people to feel that you are contagious. But the question is, are you contagious, or is that a myth? Filiform warts have formed on your face, and you have become very conscious of them and how you may interact with people. The first question on your mind more than likely is, “Are filiform warts contagious?” Unfortunately, the answer to this question is yes, filiform warts are indeed contagious. Very contagious. Warts and viruses contained within, can be spread from touch. This goes for you and other people, as you can also spread filiform warts to other parts of the body via touch. Shared cloth articles can also carry the risk of passing on warts. Things like bedding, clothing, and facecloths where they may have touched warts, can easily pass them on to others. With this in mind, there are ways to treat filiform warts, both medically and with home remedies. The best way to prevent the spread of filiform warts, is get them treated as soon as possible when you realize that you have them. Luckily there are a number of filiform warts treatments, both medical and home made, that may work for you and help solve the problem. 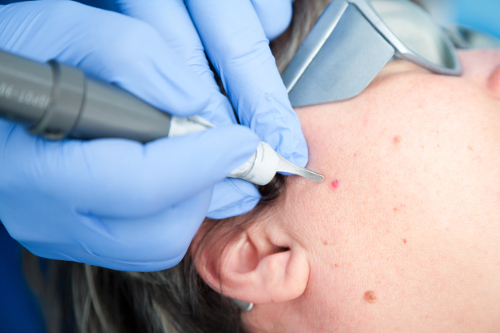 Science has progressed to the point where it can use lasers to treat warts. The good thing about laser treatment, is that it leaves virtually no scars, and it’s very easy for the laser to pinpoint the roots of the wart. There are some creams your doctor may prescribe that will also do the trick. Most of them will contain a certain amount of salicylic acid to help burn out the wart. Unfortunately, this may leave some scarring. On the other end of the spectrum, your doctor may use liquid nitrogen to battle filiform warts. The liquid nitrogen will freeze both the wart and the virus creating it. The good news about this treatment, is that it should leave no scars. If a particularly nasty filiform wart gets dug in deep, minor surgery can be done to dig it out from the root. This is usually a last resort, as this method will leave a scar. All of these methods require a doctor, but there are some home remedies that do not, and may work perfectly fine to get rid of your filiform warts. We’ve gone over a number of medical treatments for filiform warts, but you may be interested to know that there are a number of filiform wart home treatments as well. Before attempting any of these, you may want to consult your doctor. Cut a pineapple slice in half, and rub it into the wart. The acid and vitamin C from the pineapple should help to kill the wart and repair the skin. Tea tree oil is the miracle remover of many skin issues. Put a few drops of tea tree oil onto the wart, and then bandage it if possible. If bandaging is not possible, use a cotton ball to wipe the tea tree oil into the wart. Take one aspirin tablet, and crush it into powder. Mix that powder with some water in order to make the powder into a paste. Apply the paste to the wart. This treatment works best if it’s repeated over a few nights. Fresh aloe vera gel can be applied to the wart to help clear up the cause of it, as well as heal the skin around it. Again, if you are unsure about trying these, make sure to consult with your doctor first. Filiform warts and their causes are nothing to play around with. Filiform warts on eyelids, lips, and around the neck can be worrisome and stressful. They may not be harmful to the physical body, but make sure to try and take care of them as soon at they appear, so they don’t spread beyond their starting points.